Yep, you read right. Roland Super JV-1080, from 1994. I just got it last week and love it. Why, you ask? (I thought you would). Ok, I, like many, started out using outboard gear (keyboard and rack mounted synths) to compose music. Synth manufacturers always set out to provide better emulations of instruments such as electric guitars, basses, orchestral instruments, drum kits, etc. As the technology advanced, so did these emulations. Enter today’s use of digital audio workstations, 24-bit, 48-bit sampling resolutions, greater modeling, and faster computing power and you have software synths and samples that sound pristine and unmistakably realistic in quality. I use one of the big seven DAWs, Logic Studio, and like all seven (with the exception of Reaper, I think), Logic employs the latest in sampling technology, synthesis, modeling, etc. That being the case, why would any musician with access to today’s DAWs, choose older technology for composing? While I won’t repeat personal reasoning I’ve stated in previous posts, suffice it to say that…I just like the sounds of this particular rack mount synths and the expandabilty it offers. For 1994 technology the orchestral (primarily string ensembles) are fantastic. Roland has always been known for their superb emulations for just about any sound they chose to craft. I’m particularly fond of the factory presets in Bank C. There are some really nice pads and string ensembles that breath inspiration as soon as I hear them, especially for doing chillout and downtempo tracks. Another reason for choosing this particular synth module is that the presets are good enough (to me) to use right off the bat. I’ve done some synth programming over the years on two different Yamaha units, but never took the time to get into it. Frankly, with the graphical interface in DAWs, I’d sooner take that easy route then to fiddle around trying to use an editor to save the new patches, or worse yet, program from a little LED or LCD screen. 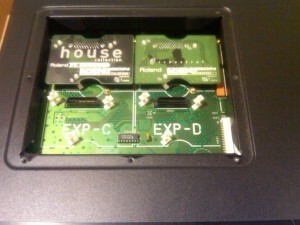 The presets are easy to get around, via manually or by sending MIDI messages from your controller to change patches. What really made me pick this module was a YouTube video of a piece for a film score that was done with the JV’s Orchestral I expansion card. If I closed my eyes, I’d be convinced it was an orchestra and not a synth. Add that to the fact it was done on 1994 technology, and I was pretty much blown away. 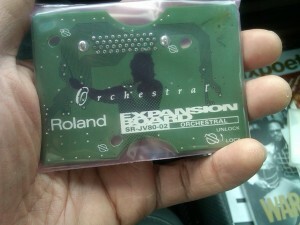 I decided to hop on eBay and get the Orchestral I card as my second expansion card. I found the entire list of the 20 or so expansion boards cards Roland developed for use here and listened to contents of each one here here . The sounds are REALLY good. There are some, mainly the brass ensembles, that sound (even in their expertly recorded sample demos) as if they are being played by a keyboard, but 17 year old technology, Roland really did a great job. I’m looking forward to composing some tunes for a future release using the JV-1080, and will probably move it from the rack in Studio B to the main rack in studio A, since there is Logic Studio environment created for it. In the meantime, I’ll be having fun learning/using it as well as satisfying my desires for buttons, knobs and LED displays when making music… LOL.